Wanderers slumped to a 4-1 home defeat to Blackpool with former on loan striker Richard Walker grabbing two goals for the visitors. A shambolic defensive display by Wycombe, albeit in wet and windy conditions, saw Scott Taylor open the scoring on 20 minutes after Dannie Bulman had the lost the ball in midfield. Walker headed home a second four minutes later following a weak clearance by Martin Taylor and it was Walker again who made it 3-0 three minutes into the second-half when he bundled the ball home following a corner from the right. Wycombe grabbed a consolation goal on 82 minutes when Jermaine McSporran converted from just right of centre after Steve Brown had stormed into the visitors penalty area. However, Blackpool's joy was complete when John Murphy tucked the ball home in the 87th minute after Taylor failed to hold Walker's low shot from the left. Wanderers had gone into the game looking for their fourth consecutive victory but it was a case of back to reality as a barebones Wycombe line-up struggled in the extreme conditions at Adams Park. With up and coming defender Roger Johnson injured, Keith Ryan stepped into the centre of defence alongside Mark Rogers, while the other change from Saturday's victory at Bournemouth was a surprise start for Gavin Holligan. There was little warning of what was to follow as Wycombe opened the game brightly. Michael Simpson ran in from the left on six minutes before looping a shot over the crossbar, while Chris Vinnicombe's speculative effort two minutes later threatened the new (and working) scoreboard more than the Blackpool goal. Wanderers continued to threaten with Mark Rogers seeing a his flick header picked out by Phil Barnes in the visitors goal on 11 minutes. Wycombe's purple patch was completed in the 18th minute when Darren Currie's cross from the left saw Bulman's header cause problems for the Blackpool defence. However, it was Bulman who was initially at fault for the opening goal on 20 minutes. Bulman lost possession in midfield and Walker pushed the ball out to the right where Scott Taylor saw his placed shot deflect off the boot of Keith Ryan, over Martin Taylor and into the far corner of the net. The visitors were 2-0 up four minutes later following a comedy of errors in the Wycombe defence. Mark Rogers opted to push the ball back to Martin Taylor but the normally reliable Taylor failed to get good contact on his clearance and it was immediately fed high back into the box from the Blackpool left. Taylor came again but Murphy was there first to lay the ball back to Walker who headed home with ease from around six yards. Almost in sympathy, Wanderers new scoreboard managed to show the wrong score and then re-set the time gone to zero. How Wycombe wish they could have turned back the clock on two abysmally defended goals. Scott Taylor could have made it 3-0 on 34 minutes as Wycombe were exposed again down the right wing before Wanderers enjoyed a brief spell of pressure where Currie's corner from the left on 41 minutes was left wanting that vital touch. 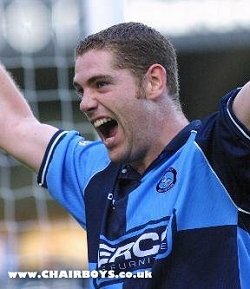 It was over and out for Wycombe on 48 minutes when Simpson's mis-kick gifted Blackpool a corner on the right. John Hill's delivered the ball into the heart of the Wycombe goal and it was Walker who gave a finishing lesson once again. Lawrie Sanchez sent on McSporran and Brown for Holligan and Currie but it was really a lost cause by that time. Richard Wellens could have made it 4-0 on 57 minutes when his low shot from the left skidded just wide of Martin Taylor's upright. Three corners in quick succession for Wycombe culminated in Stuart Roberts' returned cross from the left being headed over the Pool 'keeper by Rogers but the effort was ruled out for offside. McSporran picked up a needless booking on 67 minutes when he tangled with John O'Kane following a late tackle on Steve Brown by Scott Taylor. The referee had played the advantage but the ball ran out of play for a Blackpool throw-in. 'Jocky' then decided to grab the ball from O'Kane with the obligatory pushing and shoving ensuing. 'Jocky' should have scored on 81 minutes when he fed the ball out to the left for Devine to run on to but after Devine's shot was parried at the near post, McSporran shot wide of a virtually open goal. McSporran did get on the score sheet when Brown stormed forward into the right side of the penalty area and when the ball broke loose, 'Jocky' managed to slide the ball back into the net. However, any thoughts of late comeback were banished in the 87th minute when Walker's low shot from the left stuck in the mud in front of Martin Taylor's dive and Murphy had the simple task of tapping the ball home from close range.